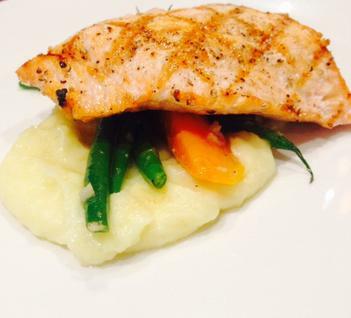 Cut the salmon filets in 4-ounce pieces for adults and 2-3-ounce pieces for kids. Season with salt and pepper and rub with a small amount of olive oil. Place on the grill and cook to desired doneness. Bring three cups of water to a boil. Add salt and cook beans for four minutes. Remove from the boiling water and place in an ice bath. Once chilled remove and reserve the beans. Place Yukon gold potatoes (peeled and cut up) in cold salted water to cover. Bring to a boil and cook through. When potatoes are done, remove from water and place on baking sheet, place in 325 degree oven for five minutes. Once out of oven, purée potatoes in food mill or mash with a potato masher. Add milk, butter and olive oil and mix until smooth. Season with salt and pepper to taste. 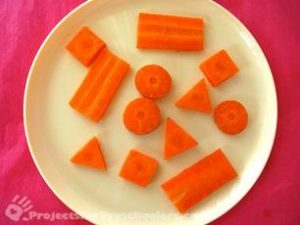 Cut carrots into funky shapes [zig zag, lightening bolts, squiggly—just have fun!]. Place in cold water with one slice of ginger, honey and a small amount of salt. Bring to a boil and cook through. Drain and reserve. Place a spoonful of potato purée in the center of the plate. Reheat carrots and green beans in a pan with olive oil, as needed and then plate atop potato purée. Then sit the grilled salmon on top, just off center, so all the bright components can be seen. Enjoy, your kids will love it!